The Catholic Syrian Archbishop of Mosul in Iraq, Georges Casmoussa, is appealing to the Iraqi government to spare the life of Tariq Aziz, who was given a death sentence by an Iraqi court on October 26. 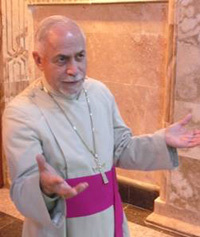 Aziz, a Catholic, is now 74, but served as foreign minister and deputy prime minister under former Iraqi president Saddam Hussein. The Roman Catholic Church said it opposes the sentence because it opposes the death penalty in all cases. An attack by nine Sunni Muslim terrorists on Our Lady of Salvation Syrian Catholic Church in Baghdad, Iraq on Octiober 31 left three priests and dozens of parishioners dead. The nine terrorists were killed when Iraqi security forces stormed the church on November 1. The Canadian arm of the Catholic Near East Welfare Association (CNEWA) is calling on the Canadian government to help find a diplomatic solution to Iraq’s political crisis. CNEWA said more Christians may become innocent victims of the struggle between Arab Sunnis, Kurd Sunnis and Shiite Muslims. However, CNEWA said the attack on the church had the unexpected result of Sunni, Shiite and Christian leaders mounting joint demonstrations for peace. The Institute of Marriage and Family Canada is hosting a book launch celebration from 5:30 to 7:00 pm Thursday, November 18 at Nicholas Hoare Books, 419 Sussex Drive, Ottawa, to celebrate the publication of William Gairdner’s new book,’The Trouble with Canada…Still!’ An English professor and an Olympic athlete, Gairdner is founder of Civitas, a Canadian organization dedicated to discussing freedom and order in today’s world. He is author of several bestselling books, including The War Against the Family (1992). Roxanne’s Law (Bill C-510, An Act to Prevent Coercion of Pregnant Women to Abortion) was deemed ‘votable’ October 19 by the Canadian House of Commons Standing Committee on Procedure and House Affairs. The bill was debated for one hour on November 1 and will likely be debated for a second hour December 6 or 7, followed by a ‘second reading’ vote on December 8. If it passes, it will be sent to a committee for further study. The bill is named in honour of Roxanne Fernando, who was killed by her boyfriend after refusing to abort their child. Further information on the bill is available from The Evangelical Fellowship of Canada and the Institute of Marriage and Family Canada.